When Can I Get a Bankruptcy Off My Credit Report? Home > Credit Score > When Can I Get a Bankruptcy Off My Credit Report? I Saw My Wife’s Credit Report … and I Freaked Out! Should You Be Worried About Credit Report Inquiries? Filing for bankruptcy in order to deal with overwhelming debts can be a frightening and confusing prospect. But if you’re among those who have opted to use this approach in order to turn a troublesome financial picture around, you’re probably wondering what the next step should be. And more importantly, how long it takes to get that bankruptcy removed from your credit reports. The good news is, bankruptcy filings don’t mean the end of obtaining credit and in fact you can try to speed up the removal process, while also rebuilding your financial profile quite successfully. To begin with, it’s important to understand that there are two types of bankruptcy. 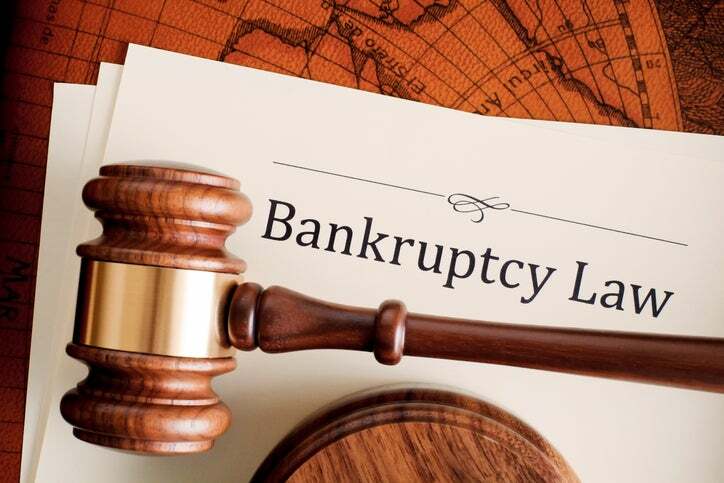 Chapter 7 bankruptcy is full liquidation of your assets and it does not involve filing a repayment plan. Instead assets are sold and the proceeds are used to cover the debts. It takes 10 years (from the date of filing) for this type of bankruptcy to come off your credit report. Chapter 13 bankruptcy on the other hand allows individuals to develop a plan to repay some or all of their debts over the course of three to five years. The bankruptcy itself will automatically be deleted from your report seven years from its filing date. Can You Speed up the Removal Process? Under some circumstances it may actually be possible to get a bankruptcy removed from your credit report sooner than expected. In other words, there’s nothing stopping you from getting that bankruptcy removed before seven to ten years. How do you do that exactly? File a dispute with the three credit bureaus. Review your bankruptcy filing and the items related to your bankruptcy that appear on your credit report carefully, advised Exantus. If you find any incorrect information, you can file a dispute. In addition, when you file a dispute with the credit bureau it must be verified and validated in order for it to remain on your credit report. If the items you are disputing were not verified properly or if they are not verified within 30 days of your dispute by the credit bureaus, they must be removed from the report and this includes bankruptcies. Before you start thinking about when you might be able to get that next credit card or line of credit again, it’s important to make sure you correct whatever behaviors got you into trouble in the first place. When Can You Get a Line of Credit Again? Once you’ve established good financial habits, the best way to start rebuilding your credit profile and score is to obtain a secured loan of some type. This includes secured credit cards from a bank or a line of credit. “Most banks will approve you for an approved secured credit card a few years after filing bankruptcy. That should be the next step someone takes,” Exantus said. In addition, don’t be surprised if you start receiving credit card offers during the seven to 10 years that a bankruptcy remains on your report. Credit card companies make more from customers who have low credit scores or bankruptcies. “You are a prime candidate for credit because most credit card companies know that a person has filed for bankruptcy and that they are going to want to get credit again. And they know they can charge you a higher interest rate because you have a lower credit score,” Exantus added. While bankruptcies may be a somewhat unpopular topic or continue to carry a stigma socially, there can be a silver lining to going down this road. You can also carry on the conversation on our social media platforms. Like and follow us on Facebook and leave us a tweet on Twitter. This article has been updated. This article was originally published April 18, 2013. Sign up for our Credit Report Card and receive the latest tips & advice from our team of 50+ credit and money experts as well as a FREE Credit Score and action plan. Sign up now. If your credit is poor and you’re trying to determine which card to apply for, you can use Credit.com’s credit card comparison feature for credit cards for poor credit here: http://www.credit.com/credit-cards/bad-credit/. credit one is good but there is an annual fee, i cant really find a card without one at this point! Unfortunately if you file bankruptcy it will remain on your credit reports for ten years, even if you never went through with it. The filing is a matter of public record, and that is what is being reported. You may want to check with your attorney to see he or she has any suggestions. I don’t know how to retrieve the passwords if you lost them. But you can create a new request – I just did that myself for my annual review and it worked fine. That’s a really interesting question. By law, bankruptcy can be reported for ten years from the filing date. The fact that the major credit reporting agencies remove Chapter 13 cases 7 years after filing is voluntary. So they aren’t under any legal obligation to remove it that I am aware of. However, the intent of that program is to give you “credit” so to speak for repaying some of your debt. You could try filing a complaint with the CFPB and see what happens…I’d be interested in the results. I’m interested in knowing what your outcome was. I too, am experiencing the same dilemma. I filed Chapter 13 in 2008 and converted 2012 with almost 4 years of payment history. I have since mailed off a dispute to all 3 Credit Bureaus asking for a deletion due to the fact that I have made payments to the creditors. I have searched high and low looking for laws/rules that govern the deletion time frame for converting a Chapter 13 to a Chapter 7 and have found none. Considering that I read on one of Experian’s credit forum stating Chapter 13 will be deleted after 7 years for payments being to creditors and Chapter 7 10 years due to no payments being made at all, I am praying to God they will delete mine because I have made 4 years of payment via payroll deductions. When my results come back I will re post. I disagree. Please contact me as I know people that can help. I am interested in who you know that can get bankruptcies removed..please contact me.. I filed for bankruptcy in oct.of 2005,10 yrs. ago. Will this bankruptcy automaticly fall off my credit report, or do I have to go through many exhausting head trips to get it off? I have my credit report coming ,from all 3 reporting companies, In 3 weeks. It should come off automatically (but you might want to give them 30 days . . .). If it does not, dispute it. accept there would be no compensation for the doctor’s negligence. No compensation received from the negligent doctor. Meanwhile, I went through 2 more surgeries and 3 years PT (Total time including at PT institution 3x/week. Total per day PT = 19Hrs./24Hrs.) Malpractice doctor is still out practicing, today, meanwhile he admitted I was one of 4, that he made medical errors on! We had medical insurance, but much was not covered by the insurance. Only, a wealthy person could have paid the outrageous medical bills. So, we were left with no other alternative, other then to file bankruptcy. Consequently, like many of you, we are now marked for years with 2 bankruptcies on our credit report. If, only the government knew how devastating it is to have to decide to file bankruptcy, especially when we did nothing wrong! The educational and medical systems are in the wrong, but we have been penalized emotionally and on credit reports/public records! Thank you for reading. I wish you all the best. can you still build up your credit score with a bankruptcy on the report. I mean can you still gain a high score? can you build up your credit score with a bankruptcy listed on the report..I have establised my credit once again but still have a bankruptcy listed on the report.. I can’t get credit with any so call major companies but i still have good credit. Question? In 2008 I had to file bankrupcy due Multiple Scelosis,lost my job,had to use up my credit cards,savings,using a lawyer and so on…Fast forward now to 2016,Had my credit fixed I thought,but its messed up again due to having to fixed my car over 8,000,lent I thought was a friend 5,800 was “suppose to pay me back” but never did,then this past year the state of Connecticut decided to cut things for the disablec ie (me)! So I had to buy food with my credit cards so on…. Anyway,I am about 19,000 in debt! Can I apply for bankrupcy again? I am losing sleep, migraines,2 flareups because of this! I know I wont lend to no one ever AGAIN! I just thought,they would! I am on social security now,back in 2008,I had just started…I have no choice but to, Any Ideas or Answers No rude remarks please, Thank You! Certain credit cards and other financial products mentioned in this and other sponsored content on Credit.com are Partners with Credit.com. Credit.com receives compensation if our users apply for and ultimately sign up for any financial products or cards offered. Thanks for checking out Credit.com. We hope you find the site and the journalism we produce useful. We wanted to take some time to tell you a bit about ourselves. Lastly, much of what we do is informed by our own experiences as well as the experiences of our readers. We want to tell your stories if you’re interested in sharing them. Please email us at story ideas [at] credit [dot] com with ideas or visit us on Facebook or Twitter.